Microorganisms are everywhere – even in Antarctica! Our research in Antarctica began several years ago in cooperation with conservators and other scientists to help identify the cause of deterioration that was destroying the historic huts built by Robert Scott and Ernest Shackleton. These wooden huts were built there to house the expedition crews for up to 3 years while they explored Antarctica. After their exploits, the wooden huts and thousands of artifacts were left behind. About 100 years has passed since the huts were built and although they are located in Antarctica, significant deterioration has taken place. Molds grow and attack the wood, paper, textiles and other cultural properties inside the huts and unusual decay fungi attack the foundations. With funds from the National Science Foundation Office of Polar Programs and with the cooperation of the Antarctic Heritage Trust, Antarctic New Zealand and the University of Waikato in New Zealand we have been studying the microorganisms that are responsible for the degradation and providing information to help conserve and protect the huts. Our research over the past years has provided important new information and copies of the scientific publications are listed below. General articles have also been written about our work and can be found at the page listing Magazine Articles. Our research began with studies to better understand the microbes that were attacking the historic huts under these extreme environmental conditions. 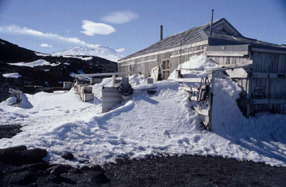 Since the huts were prefabricated and brought to Antarctica, it was expected that decay fungi causing the problems were likely brought in with the wood. However, this was not the case. The decay fungi found are well adapted to polar conditions and appear to be indigenous to Antarctica. Further study has shown that the fungi found in the wood were also the ones most commonly found in Antarctic soils where they have important roles as decomposer and recycling organisms in the Antarctic ecosystem. Research that started to better understand the microorganisms that were attacking the historic huts quickly expanded to investigate the biology and ecology of these little known but exceedingly important organisms. Arenz B. E., R. A. Blanchette and R. L. Farrell. 2014. Fungal Diversity in Antarctic Soils. Pages 35-53. In Antarctic Terrestrial Microbiology: Physical and Biological Properties of Antarctic Soils. D. Cowan (ed.). Springer, Berlin. Farrell, R. L., S. Duncan, R. A. Blanchette, B. W. Held, J. A. Jurgens and B. A. Arenz. 2008. Scientific evaluation of deterioration of historic huts of Ross Island, Antarctica. 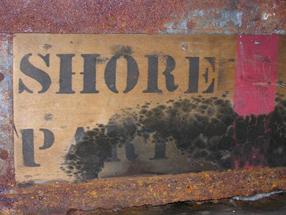 In: Historical Polar Bases – Preservation and Management. Edited by S. Barr and P. Chaplin. ICOMOS Monuments and Sites No.XVII. International Polar Heritage Committee, Oslo, Norway pp.96. ISBN 978-82-996891-2-0. Copies can be obtained from the IPCH. Arenz, B. E., B. W. Held, J. A. Jurgens, R. L. Farrell and R. A. Blanchette. 2006. Fungal diversity in soils and historic wood from the Ross Sea Region of Antarctica. Soil Biology and Biochemistry 38:3057-3064. Duncan, S., R. L. Farrell, J. M. Thwaites, B. W. Held, B. E. Arenz, J. A. Jurgens and R. A. Blanchette. 2006. Endoglucanase-producing fungi isolated from Cape Evans historic expedition hut on Ross Island, Antarctica. Environmental Microbiology 8:1212-1219. Held, B. W., J. A. Jurgens, B. E. Arenz, S. M. Duncan, R. L. Farrell and R. A. Blanchette. 2005. Environmetal factors influencing microbial growth inside the historic huts of Ross Island, Antarctica. International Biodeterioration and Biodegradation 55:45-53. R.A. Banchette, B.W. Held, J.A. Jurgens, D.L. McNew, T.C. Harrington, S.M. Duncan, and R.L. Farrell. 2004. Wood-destroying soft rot fungi in the historic expedition huts of Antarctica. Applied Environmental Microbiology 70:1328-1335. Blanchette, R. A., B. W. Held, J. A. Jurgens, J. Aislabie, S. Duncan and R. L. Farrell. 2004. Environmental pollutants from the Scott and Shackleton expeditions during the 'Heroic Age' of Antarctic exploration. Polar Record 40:143-151. Blanchette, R. A., B. W. Held and R. L. Farrell. 2002. Defibration of wood in the expedition huts of Antarctica: an unusual deterioration process occurring in the polar environment. Polar Record 38:313-322. Antarctica is a beautiful continent and much of it is covered by snow and ice. However, there are many ice free regions and temperatures can get above freezing along coastal areas and in other locations during the austral summer. Shackleton's hut at Cape Royds, Antarctica. This hut, built in 1908, has survived the extreme Antarctic environment for over a hundred years but is now under attack by unusual fungi. 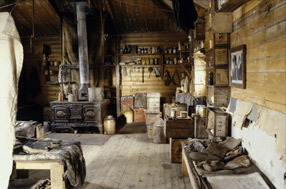 The inside of Shackleton's hut looks much like it did 100 years ago. Although the materials left by the early explorers appear to be in fairly good condition, fungi have taken a toll causing disfiguring growth on historic materials inside the hut and decay of wood in ground contact. Dark fungal growth on food storage box inside the historic hut. Cross section of wood from the hut foundation showing the wood cells with advanced stages of decay. 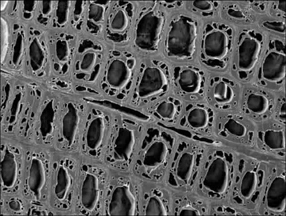 Fungi have degraded the wood causing cavities inside the woody cell walls. 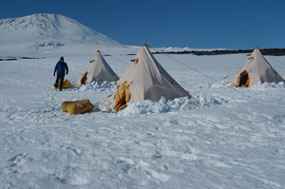 Field camp in Antarctica during one of our events. 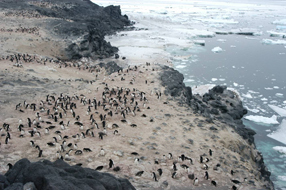 Thousands of penguins live adjacent to Shackleton's hut on Cape Royds. Penguin guano near the hut provides nutrients that can help support the growth of decay fungi. 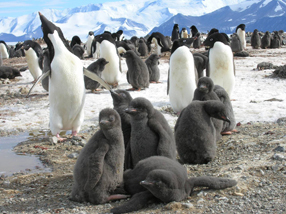 Adelie penguins with their young. 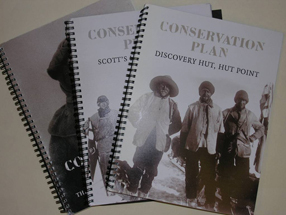 Conservation plans have been developed for the Ross Sea historic huts and large scale conservation efforts are underway by the Antarctic Heritage Trust to preserve these important historic structures. 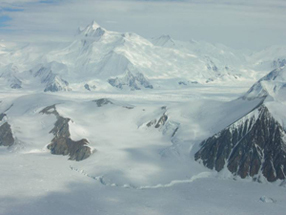 Our research investigations on the fungal diversity in Antarctica has continued beyond the Ross Sea reigon and has included many sites in the Dry Valleys and in the Antarctic Peninsula. 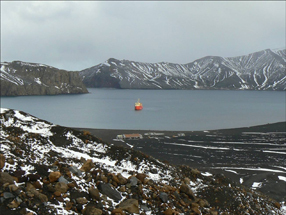 Deception Island near the Antarctic Peninsula is the site of a historic whaling staion. Our research at this island has shown an exceptionaly large diversity of fungi can be found there. Many of these fungi are causing serious decay in the historic buildings and other artifacts left on the island. More information on our studies at Deception Island.